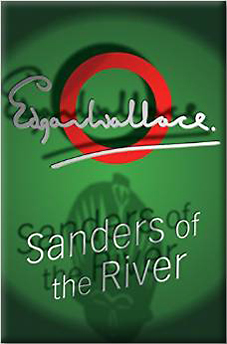 Sanders of the River was written by Edgar Wallace in 1911. This was the height of Edwardian power culminating in positive ideas about The British Empire and the role of Britain in 'civilising' its colonies. This book was written firmly in that context. It makes for very uncomfortable reading in the twenty first century, but it still offers a valuable insight into what many people thought was the way that British administrators should run their colonies. Sanders is one such caricature of the British Colonial Administrator responsible for keeping the peace along a stretch of river in deepest, darkest Nigeria. The character was probably based on the career of the Frederick Lugard who was basically responsible for the creation of the Northern Nigeria and implementing a subtle but firm form of indirect rule. The fictional character Sanders is advertised in the book as being firm but fair in the treatment of his 'children'. Indeed, the book nicely sums up the paternalistic attitudes towards empire in Edwardian England that helped to justify their ruling over such huge tracts of the world. The African tribes portrayed in the book seem to be holden to his justice and his wisdom and do not seem to be able to keep the peace without his firm hand on the tiller. Having said that, his threats are not idle, and miscreants and ne-er-do-wells are quickly dispatched by the noose for the greater good! Likewise, his steamer, the Zaire, has two Maxim guns and a troop of Housa guards who are quick to fire first and ask questions later. The book is actually a collection of short stories that are loosely tied together by Sanders himself, his steamship and an unlikely African chief called Bosambo. Bosambo is a Liberian scallywag who manages to con his way into the the chieftanship of a tribe in Sanders' district. Sanders can see through Bosambo but for his own reasons seems to put up with him. Bosambo does repay Sanders' confidence on numerous occasions, althoug he does also push his luck to breaking point again and again. The stories are certainly evocative of a disappeared imperial outpost and nicely illustrates how large areas of the empire were administered with such a miniscule bureaucracy. It also shows how British power could be called upon if absolutely necessary, although the budget constraints and motives of the Colonial Office are very cynically (if also accurately) analysed in the chapter 'Dancing Stones'. As I have already said, this book will seem very dated to the modern reader, but it will also allow the reader to enter the head of an Edwardian imperialist when the Empire was seen as only a good thing, bringing civilisation to barbarous outposts around the world. If you want to understand the role that imperialism was supposed to play in the world, and why and how it was defended for so long, then this might be an interesting and easy book for you to read.